As the bus accelerates past my stop the first drops of rain strike the widow. Staggering forward along the aisle, monkey baring between the seats I swear under my breath. Driver and weather are both on the receiving end of my silent tirade. I'm still swearing as I pull on waterproofs and rearrange my pack at the head of the ski centre road. Glencoe! 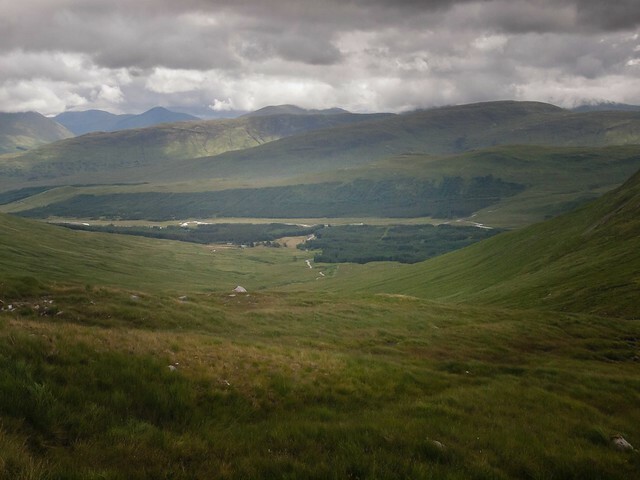 Thirteen kilometres past bridge of Orchy! THIRTEEN! I vent my frustration on an unintended section of the West Highland Way. Walking fast, stomping hard, pummelling the ground with my feet and the air with my hands. That'll teach em! It takes a few, minutes or kilometres, it's all the same, to cool my head. A head, as ever, too full of plans and preconceptions of where I ought to be. Immersion is gradual but inevitable. The rain stops and the last few kilometres are a pleasure. Warm evening sun. Rannoch glistening over my left shoulder. Stands of postcard pine cutting poses to please the tourists. Easy path down a gentle incline all the way to Victoria bridge. Both behind and before me a life of privilege. Problems that aren't problems. Thirteen extra kilometres but bonus kilometres every one. With promise of better still to come I turn West following the sun along the Abhainn Shira . It's a gentle evening. Warm sunshine paints l long views of green grass, silvery stream and blue grey mountain, with a soft light. I walk, in just a shirt, accepting that I won't quite get there but sensing that where I do get to will be just as fine. 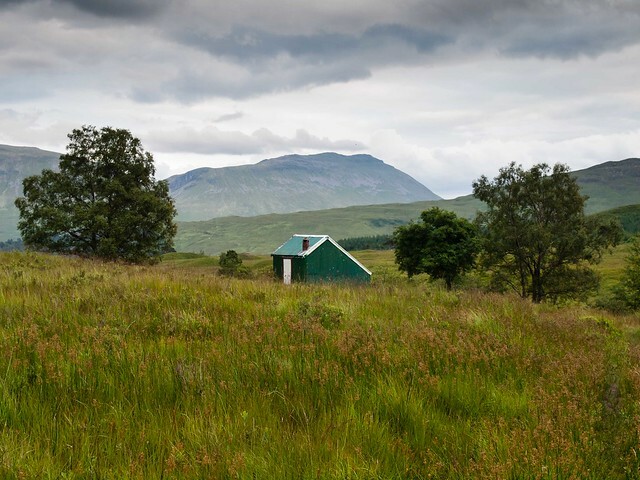 A stream to soon, at the Green tin hut, an echo of community long past, I turn right again. Uphill now. First along the burn, then across it over the shoulder and along the spur. Every step upwards. Tired legs carry me until they won't carry me further. Legs , lungs and available daylight decide where I'll camp. 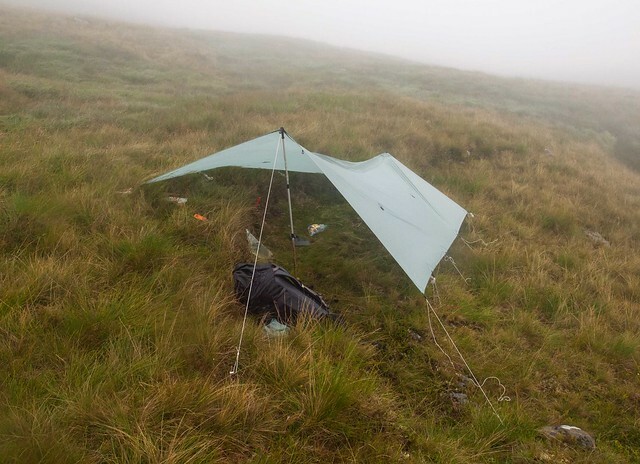 I pitch my tarp at the 600m line and, with a view across to where I should have been, I fill my stomach with hot food and crawl, fully clothed, into my bag. I wake in the early hours and, poking my face out into the wet hell barrelling through my tarp, realise I'd pitched too hurriedly. I promise myself, that the next time I pitch in the highlands I'll point the big end to the East, then zip up my bivvy and lie back down. I sleep warm and dry and then lie around, still warm and dry, waiting for a fairer wind. It doesn't come. The MWIS had been right. They'd said my weather window was a week earlier when I'd been lying on sand watching the kids play with buckets and spades. With reluctance, I peel off my bag, pack and continue uphill. Breakfast will have to wait. Plodding uphill, squinting into swirling grey, looking for my handrail, I wonder what the day will bring. One top for certain. Stob Ghabar is in easy reach and once I find the line of the old fence unmissable. The rest of the traverse, West over the Scotsman and on to Tri Tighearnan, doesn't come with guarantees. 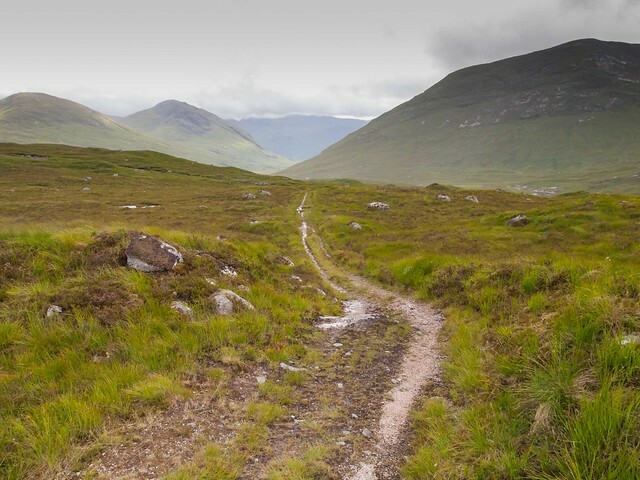 The up and down will be a challenge for my desk bound legs and whilst, for the most part, navigable in mist, there's that bit between Meall Odhar and Nan Eun. The bit that sits, unhappily incomplete at the top corners of my double sided OS sheet. The bit I want to take a good look at before stepping off. First the one I'm on and then we'll see. 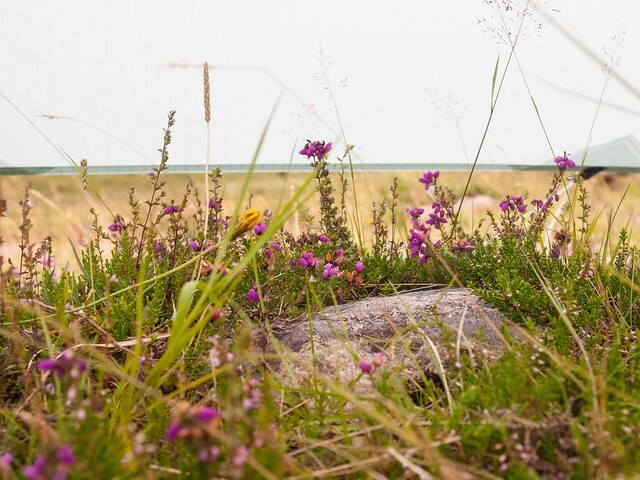 Leaning into the slope and into a wind that forces cold unpleasantness into every crack in my clothing I approach, and pass without stopping my first Munro of the summer. 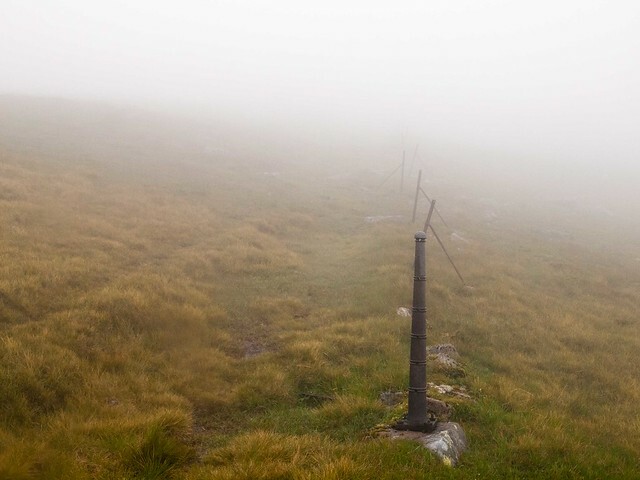 Following the line of rusty fence posts I drop off, just North of West, along the narrow grassy ridge to Sron a' Ghearrain where I swing a little to the North and, reluctantly, let go of the fence line. Walking into the white, trying to gauge distance overground and feel the slope under my feet I, guess it's time and swing due West once more to find the little saddle and make a call. I'm not happy. Just a couple of kilometres more of this, doable but relatively devoid of fun, will put me on the edge of the Ordanance surveys black hole. I briefly consider setting up my shelter, lighting my stove and waiting it out but, I need to get much further West today if I'm going to catch my train the day after tomorrow. To my left is the first of my easy bailouts. Easy in descent but a difficult decision. Linschooten says the art of this business lies in letting go. With her words resonating in my head I start down to see if I'm up to that task. First though I have to get down. Aiming just left of straight downhill I walk blind, hoping to pick up the zig zags of the stalkers path, hoping I was indeed at the saddle, hoping I'm not too far left and too close to the boulders and crags already. I'm almost back at the 600m line before the lights come back on an Meall an Araich jumps out to surprise me. The day ahead suddenly looks very different. No more of that glorious run of high ridge but instead a valley walk. Further along the Abhainn Shira and over the head into Kinglass. Not my staple, I wonder how it will sit on my stomach. I pocket my compass. I follow the path along the Allt Ghabhar and pause for breakfast. I'm just a kilometre and half across from where I slept and that has me worrying about schedules. 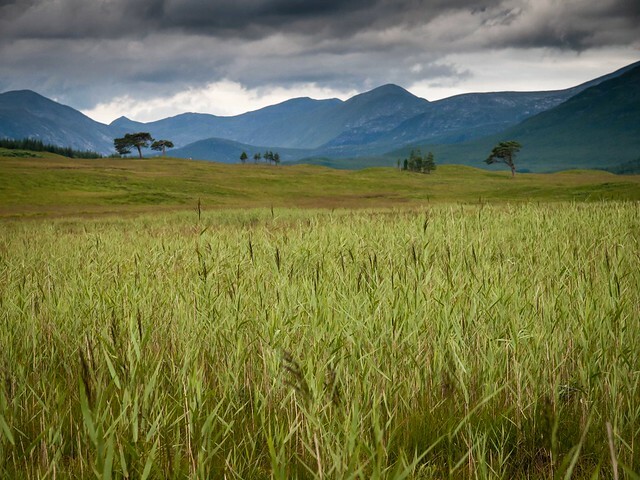 Plans for a decent break and hot food are broken, first by midges, then by rain. After a quick drink and muesli bar I'm moving again and am soon stepping out along the well trodden track that'll carry me, I anticipate quickly, as far West as I care to go. Bar the river crossings, the rest of the day becomes an easy stroll. I'm dealt a little rain and a little wind but to balance it out I get a bit of bone-warming sunshine. 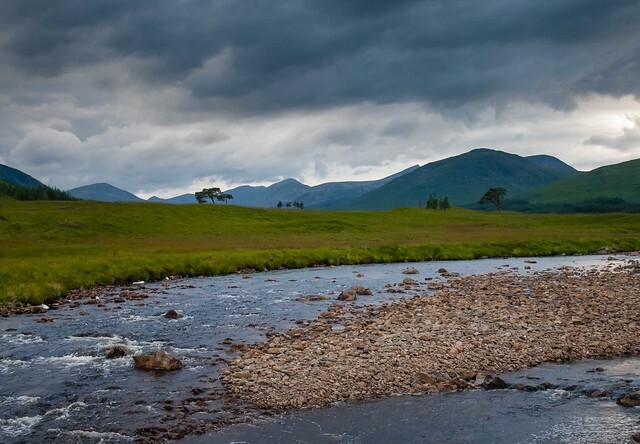 It's a varied walk sometimes next to river, past the occasional ruins of long cleared communities and skirting a scattering of lochs and lochans, every one a gem. 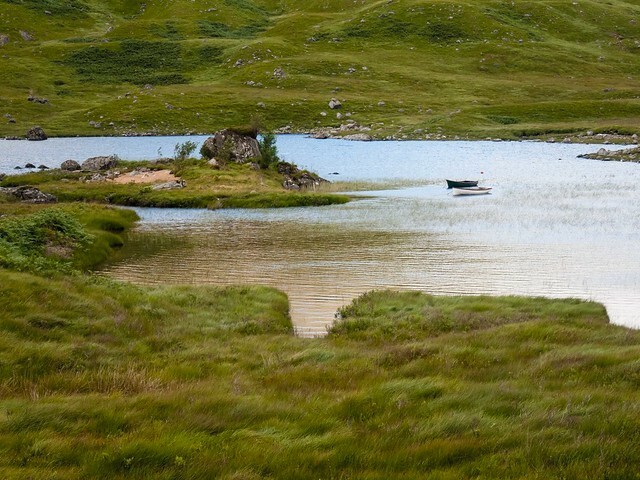 Loch Dochard is a highlight, fixing my gaze, touching my soul, and forcing a break. I'm momentarily tempted to overnight here but it's too early and, come evening, likely midge infested. Instead, I keep on, passed the mouth of Coire na Caime and into Glen Kinglass proper. All the time, on my right hand, runs the string of high tops, where I should be, the days guilty conscience. Occasional pangs of disappointment are beaten back by the slippery grey caps sitting atop the hills and their tell tail streamers of scudding cloud. I remind myself it's about letting go and focus on the fact that I have this whole valley to myself. Another six or so kilometres and a last river crossing finds me within view of Kinglass lodge. 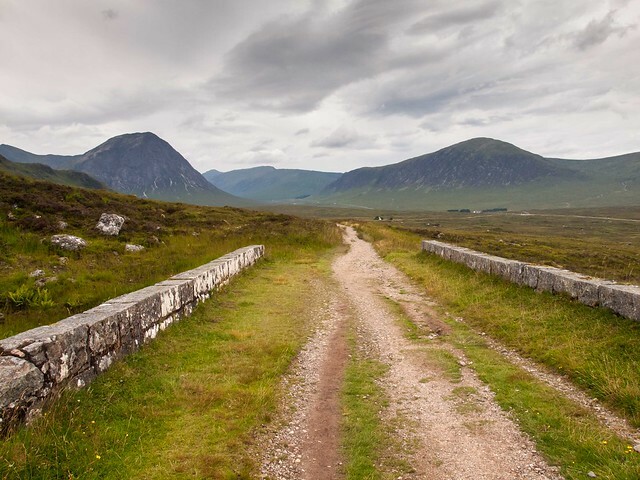 Beyond the lodge and its cluster of four wheel drives, testament to a different kind of outdoor fun entirely, I can see the stands of trees at the mouth of Coire Hallater. If all had gone to plan tonights bivvy would’ve been at the top of it. I've come far enough to make my train catchable. I'm hungry and in need of a break. I find a space away from the track, a spot in the wind that's now blowing up from Etive and midge free, put my feet up and cook a hot meal and a brew. 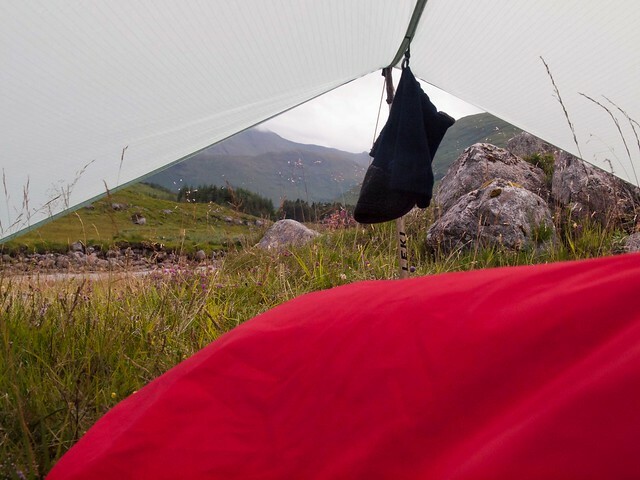 My intention is to eat, rest, move on past the lodge and turn South to camp on higher ground somewhere on Meall Copagach but instead, it being a day for changing plans, I eat, rest, pitch my tarp and go to sleep right here. Crackin' photo's (as usual) and an engaging read. I know this area very well, so brings back a few memories. IIRC the last time I was up Stob Ghabhar it was ridiculously hot (for Scotland) with out even the merest hint of a cooling breeze. Looking forward to the next part.